“We go be alright man, God will help us, we go be alright!” Pauline Fletcher Dellis recalls saying those words aloud, but remembers instantly doubting them when her 8-year-old son, with fear in his eyes, asked her: “Mommy, we going to die now, right? We going to die now.” Dellis wanted to reassure him that they would survive, but being trapped in that little shop on Union Street, with a crying 4-month-old baby, the baby’s terrified young mother, and three children, including hers, she couldn’t. 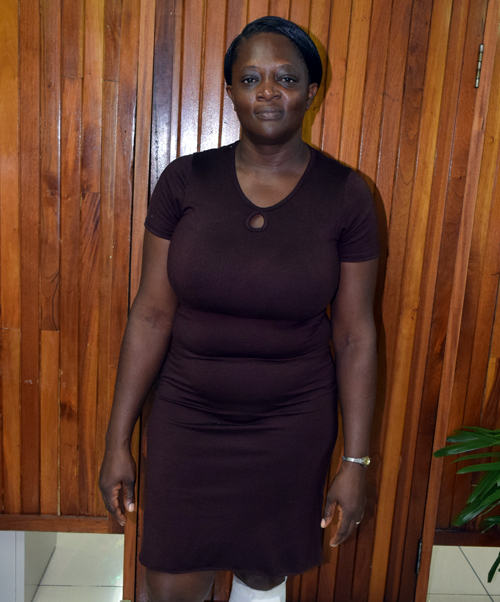 The floodwaters were almost up to her neck, and on November 22, 2017 – the day the devastating flood ravaged Montego Bay, Dellis was sure that that tyre shop would become their watery tomb. For Dellis, the light rains she witnessed earlier would not dampen her daily routine. She would leave work from her job as a Janitor, like any other day, pick up her son from school, and head straight home. When she left work that day though, she realized things would be different. “When I left work, sometime after 5 and reached on Union Street, the rain was falling harder, and the water was steadily rising,” Dellis told the Western Mirror, “it was almost up to my knees.” Worried about the safety of her son, Dellis kept walking, but soon saw something that brought her much relief. “I saw someone holding my son’s hand, because I recognized his raincoat, and they were heading into the shop (Union Street Auto Parts).” One of Dellis’ friends, whom she identifies as Jessica, had already made the trip to pick up her son for her and was headed into the shop to seek shelter from the heavy rains. Dellis joined them in the shop, where two other kids were seen waiting out the rains. “Jessica, look deh,” Dellis remembers saying, pointing to the floodwaters that seemed to have suddenly risen. The road was by then completely covered, and the water had reached the midway point of the glass windows. “Jessica, we can’t stay here so enuh, look deh!” Dellis says again, but Jessica rebutted that if they even tried to open the door, all six of them would certainly die. Dellis knew their best chance of survival was to stay in that shop, and so she did. As much as they made the choice to stay, Dellis realized that equally, they were trapped in there. “Before mi know it, the place was rapidly flooding,” Dellis recalls to the Western Mirror, “so Jessica and I took the children and put them on the counter.” Dellis explained that it wasn’t until she heard a loud ‘crack’ that she realized just how serious it was. “The water broke the bottom glass and started rushing in, rapidly filling the place up, so I took the baby from Jessica, and told her to go over the counter where the kids were. When she did, I gave her back the baby, and climbed over the counter too.” That proved to be a temporary relief, as the water quickly rose to the level of the counter, forcing Jessica to hold her baby above her head, and the other kids had to stand so as not to allow the water to cover them. “Ms. Pauline! Ms. Pauline! We go drown! We go drown Ms. Pauline! Nobody nah go help we!” Dellis remembers Jessica screaming. “No Jessica, God go help we, we go alright Jessica!” Dellis says, trying to keep her calm. “Ow mommy! Something a shock me!” Dellis’ son said, turning her focus to him. Jessica explained that the computers in the store were shorting out, which must be causing the shocking. “Because of that, I had to lift my son and put him on my hip” Dellis explained, at which point she remembers her son asking her: “Mommy, we going to die, right? We going to die now.” Hearing those words from her son, Dellis said she broke, and started crying too, feeling powerless in the grips of what she felt was sure death. By that point, the water was up to her breasts, and the kids, who were all screaming at that point, were almost submerged. “Yes, we go dead now,” Dellis said, pulling her son closer to her. At that moment, another loud, crashing sound was heard, signaling yet another section of the glass being broken. But this time, it wasn’t the water. It was a man who had swam up to the windows, wrapped his fist in a shirt, and punched the window, peering through to see if anyone was in the shop. He saw them. “We couldn’t hear all that he was saying because the water was so loud, but we heard when he said, ‘dem in ya!’” Dellis said. 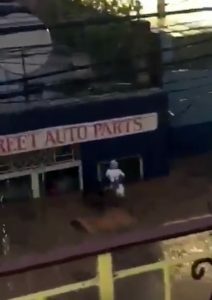 Another man was immediately seen swimming across the road, who came up to the window and offered to help them. “One by one they pulled us out, taking out the baby first and handing him to someone on the roof,” Dellis explained. In one instance, one of the children, while being pulled out, was sinking, and Dellis had to grab the electrical panel for support, which repeatedly shocked her, and grabbed the little girl by her hair and pulled her back up from under the water, at which point the heroes who came to help pulled her out. Though they got into difficulties when they were being pulled out by the men – one a fruit vendor named Javaughn and the other identified as ‘Rasta’, both Jessica and Dellis made it out alive, with Dellis suffering lacerations all over her body. She got over 25 stitches in that incident. “Those men, who were completely strangers, saved us, and we are so grateful to them, and want to thank them,” Dellis said, grateful that all of them faced the jaws of death, and lived to tell the tale. “There are still some good people in MoBay,” Dellis concluded.